Stigma, which receives pollen grains. Style slender projection of the ovary. The surface of the style may be hairy or smooth. The swollen basal portion is termed as Ovary which may have one or many chambers. The ovary contains one or more rounded or oval bodies, the Ovules (Integumented megasporangia). The ovule contains a large oval cell called Embryo sac (Enlarged megaspore). The number of carpels in each flower varies from one to many in different plants but this number is constant for families and serve as an important taxanomic character. The angiosperm ovule or megasporangium has long been considered as a bud because sometimes a shoot develops from it; and because it was borne on placenta which was considered axial; because from it, as a seed, the axis of the new plant develops. What is Sui Generis – Define Sui Generis? 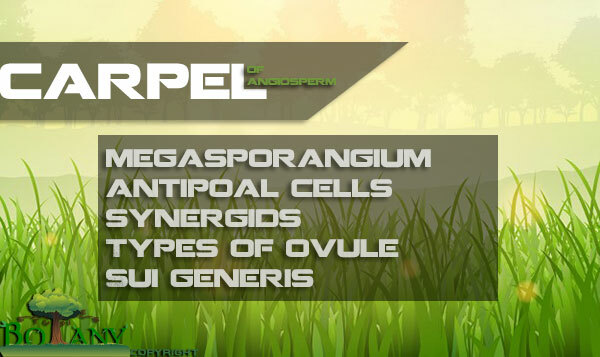 Megasporangium has more commonly been considered of folio nature – a sporophyll, a leaflet, a lobe of a leaf, the tip of a leaf, etc. Some are of the view that it is a “new structure”, an organ known as “Sui Generis”, a complete and independent organ inserted on the stem. However, fundamentally, it is recognized as a structure that bears sporogenous tissue in which megaspore develops. The ovule is termed as an Integumented Megasporrangium. The nucellus is the sporangium and the integuments are the protective structures. The ovules are borne in the ovary on a specialized tissue called the Placenta which is supplied by the poorly developed vascular tissue. Each ovule is attached to the placenta by a short stalk known as Funicle. The funicle maybe long and curved, or short and stout. The long funicle maybe adnate to the ovule body forming a ridge, the Raphe. The place of attachment of the funicle with the main body of the ovule is termed as Hilum. The main body of an ovule consists of a mass of sporogenous tissue called Nucellus which is surrounded, except at the tip, by two coverings or Integuments which arise as outgrowths from the chalazal end. The small opening left at the apex of the integuments is known as Micropyle. The junction of integuments and the nucellus is called Chalaza. The number of integuments is generally two. The inner integument is formed first than the outer one. In some plants belonging to gamopetalous families the number of integument is one. In certain cases, no integuments are produced e.g., in some parasitic families. the presence of one integument is considere as an advance character which has arisen either by fusion of two integuments, or by the reduction of one integument, generally the inner one. 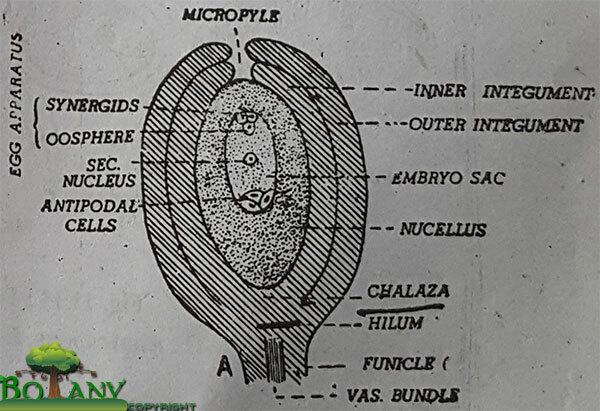 In a mature ovule, towards the micropylar end, a large cell called Embryo Sac is present embedded in the nucellus. 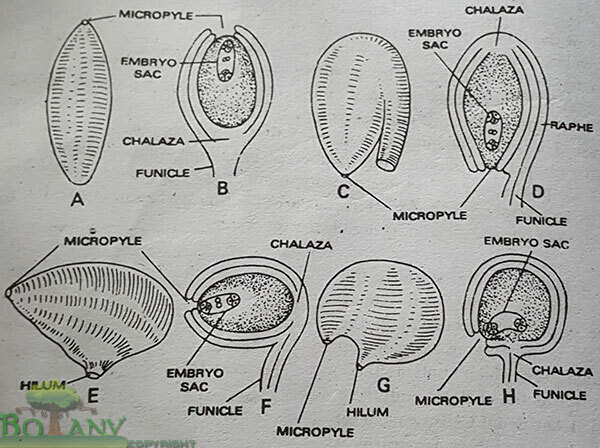 The embryo sac is actually an enlarged megaspore which contains three small cells towards the chalazal end, these cells are called Antipodal Cells, while a set of three cells known as Egg Apparatus is present at the micropylar end. The two upper cells in this egg apparatus are called Synergids or Help Cells, While, third lower cell is the Egg or Oospore. In the center of the embryo sac a nucleus termed as Secondary Nucleus is present. The ovule is orthotropous when it is straight and upright on the placental surface. The micropyle, chalaza and funicle, all are in a straight line, as in members of Polygonaceae. It is also called straight ovule. The anatropous ovule is inverted thus the name applies; inverted ovule and is adnate or appressed to the funicle, and the micropyle usually faces the placenta. The ridge formed as a result of the fusion of the funicle and the integument is called Raphe. The anatropous ovule is characterstics of Ranales, Helobiales etc. The ovule is more or less bean shaped. The micropyle faces the placenta and is attached near the middle of the ovule. These types of ovules are found in the members of Cruciferae, Caryophyllaceae, etc. This ovule is classified by another name curved ovule. In this type of ovule, the funicle is adnate to the ovule proper for about half of its length and the micropyle faces laterally. Therefore, the ovule is placed at right angles to its funicle. That’s why the amphitropous ovule is termed as transverse ovule. The nucellus and the axis remain in the same line in the beginning but due to rapid growth on one side, the ovule gets inverted. This curvature continue till the ovule turns completely and once again the micropyle faces upwards, e.g., in Opunta.